A protester outside a closed gate at the Port of Entry facility in Fabens, Texas. Last week that same judge in San Diego, Calif. ordered the government to return children under the age of 5 to their parents by next Tuesday. Older minors must be reunified with their parents by July 26. In court documents filed late Thursday, the administration says it is working "diligently" and dedicating "immense resources and effort" to comply with a court order to reunify the families. 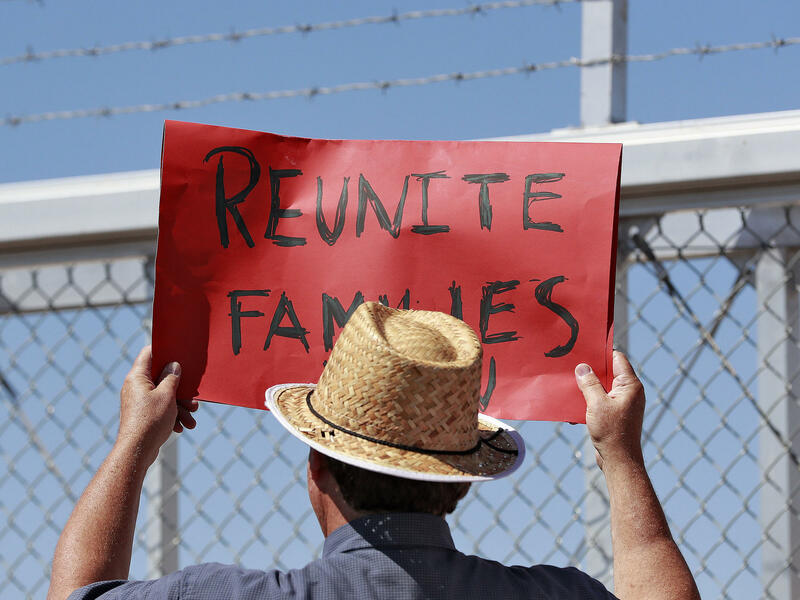 But in the court filings, the government says it "may need clarification on or some relief from certain parts of the order, so that Defendants can safely reunite families." Judge Sabraw held the status conference Friday with lawyers from the Justice Department and also from the American Civil Liberties Union, the group that sued the government in a class-action lawsuit over family separations. That lawsuit was filed even before Attorney General Jeff Sessions announced the "zero tolerance" policy in April, promising to prosecute all illegal border crossers. Justice Department attorney Sarah Fabian told Judge Sabraw that thus far the administration has matched 83 minors to 86 parents and 16 children under age 5 have not been matched to their parents. The administration's request for more time comes a day after Health and Human Services Secretary Alex Azar told reporters that the government knows the identities and location of all the minors under the department's care and will comply with the court order. Azar also called Sabraw's deadlines "extreme." The government's court documents describe an extensive and painstaking effort to collect information between the Departments of Homeland Security and Health and Human Services; verify the parentage; and assess the parents' "fitness" to receive their children. The government is using DNA testing to verify that parents are related to the children they claim. In his comments on Thursday, Azar said that "under 3,000" minors were separated from their parents. The court documents say that the government has identified "approximately 101 minors under age 5" under the care of HHS's Office of Refugee Resettlement.